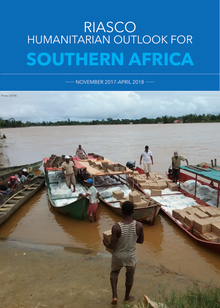 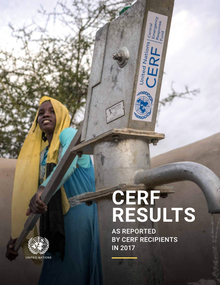 Southern Africa continues to recover from the 2015/2016 El Niño-induced drought, which by January 2017 had affected about 41 million people across the Southern Africa Development Community (SADC)1. 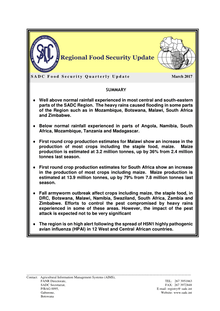 The substantial government- and SADC-led response, supported by $900 million from the international humanitarian community2, empowered farmers to take advantage of a good 2016/2017 rainfall season, delivering an April 2017 cereal harvest 3 per cent above the 5-year average. 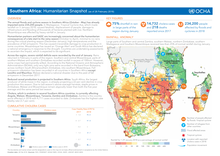 The 2015–2016 El Niño phenomenon resulted in the worst drought in 35 years for much of southern Africa. 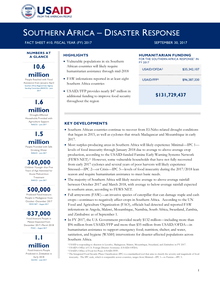 Swaziland and Zimbabwe), an estimated 16.1 million people required assistance between December 2016 and March 2017, including some 5 million children who required urgent humanitarian assistance. 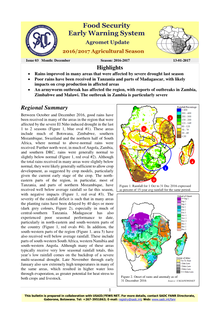 The April 2017 harvest is expected to be above-average, with Tanzania, parts of Madagascar and northern Mozambique the exceptions. 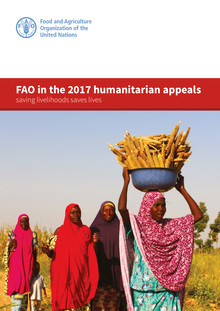 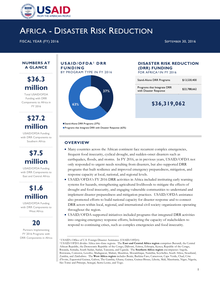 A good agricultural season is critical after two consecutive droughts led to unprecedented levels of food insecurity. 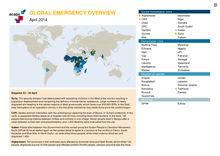 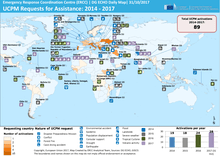 Countries in the region continue to battle several hazards with potentially detrimental effects on food security, including an armyworm outbreak. 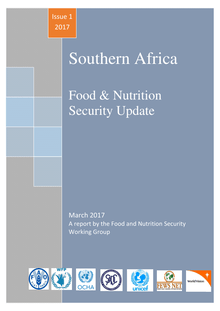 Good performance of the current growing season (Oct 2016 – April 2017) is critical for Southern Africa, after suffering from two consecutive droughts induced by a long lasting El Niño event which led to unprecedented levels of food insecurity. 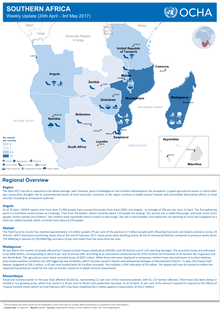 An outbreak of fall armyworm, a new pest in the region, has been reported in Zambia, Malawi, Zimbabwe, Botswana, South Africa, Namibia and Swaziland. Regionally, around 330,000 ha of staple crops (especially maize) have been affected. 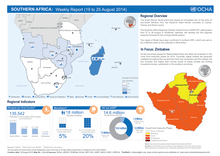 The remaining SADC mainland countries remain at high risk. 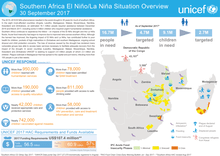 The South African Government has placed an immediate ban on the entry of non-South Africans from the Ebola-hit West African countries of Liberia, Guinea and Sierra Leone. 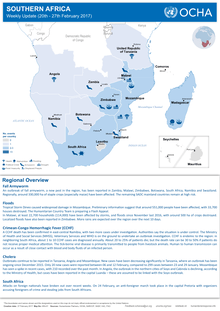 The Southern Africa Regional Climate Outlook Forum (SARCOF), taking place from 27 to 29 August in Windhoek, Namibia, will develop the first regional seasonal forecast for the coming rainfall season. Two cases of Ebola have been confirmed in northern DRC, which are said to be a different strain to the outbreak in West Africa.